No, not as great as projected or predicted before the season. But with the No. 1 pick and a roster that includes Kyrie Irving, young prospects and salary cap space, the Cavs will be the story of the draft and the start of free agency. They’re both potentially in position to build a case to try to attract potential free agent LeBron James and potential trade target Kevin Love. There is a variance of opinion on the No. 1 pick among Kansas’ Joel Embiid and Andrew Wiggins and Duke’s Jabari Parker. Assuming Embiid is healthy (he’s had back problems in college), with he and Irving the Cavs could be a very attractive destination for a return to Cleveland for James, especially if Miami loses in this playoff round or the Finals. 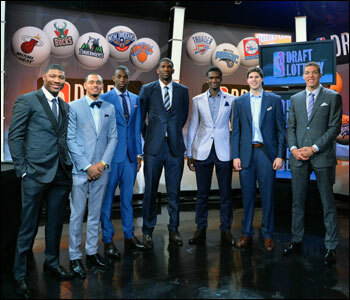 Prospects Marcus Smart, Tyler Ennis, Andrew Wiggins, Joel Embiid, Noah Vonleh, Doug McDermott and Aaron Gordon gather for a photo during the 2014 NBA Draft Lottery on Tuesday. Plus, now the Cavs are in position to make the best trade offer for Love, who is rumored to prefer to leave Minnesota for a winning situation. The Cavs could be in position to trade for Love and still be in position to have Irving and make a free agency offer for James. With the Lakers getting the No. 7 pick and Boston No. 6, the picks would figure to hold less appeal to the Timberwolves in trade. What gets overlooked with Minnesota is they are good enough to be a playoff team next season with Love and also have a lottery pick, No. 13. Then even if Love were to leave after next season they’d be well under the salary cap and could pay for a free agent rather than having to take someone from another team. They likely won’t be desperate to trade Love unless they can get a good package of high draft picks. Another potential intriguing situation for the Cavs would be the Jazz, who desperately want Duke’s Parker, who is a member of the LDS Church and would be a future face of the franchise. The Cavs could probably get the pick of anyone on the Jazz roster. Plus, the Jazz has the No. 5 pick in the draft. With both teams having young prospects there are plenty of scenarios. Similarly with the Raptors. Right up to a few days before the February trading deadline, Raptors management still was debating whether to make trades to go into the lottery for a chance at Canadian Andrew Wiggins. The Raptors only have pick No. 20, but they showed even with a good season an inability to get past the first round against an average Nets team. For a player who’d be the face of their franchise, you could see them offering anyone, including All-Star DeMar DeRozan. The Lakers and Boston, as they’ve indicated, also figure to put their picks in play for veterans and this draft generally is considered strong through about the first 10 selections. There’s considerable debate at the top with the consensus being that Embiid, because he is an active seven-footer with strong defensive instincts, has the highest upside. But he’s the most worrisome because of back problems in college and a refusal to take a league physical at last week’s draft camp. Parker is considered the safest pick, a virtual sure NBA All-Star, if not a superstar. Wiggins has the greatest athletic talent, but is limited in his basketball knowledge and seems at time not to compete hard. Then it gets more in the eye of the beholder and need as there are talented players, though all with flaws of either young or inexperienced or weak in shooting. The Bulls have picks Nos. 16 and 19. Their principal needs are shooting and a backup center. It’s a particularly weak draft for centers and the best shooters probably will be gone in the lottery. You’d figure the Bulls could try to use both picks to get up a few spots to select a shooter if they have a favorite one, like Gary Harris of Michigan State, Nik Stauskas of Michigan or Doug McDermott of Creighton. All are expected to be selected in the top 14. There could be a half dozen moves in the lottery before the draft. So any mock draft is just a guess at this point. I see Wiggins mentioned a lot on top in some of the mock drafts, but basically every scout I’ve spoken with has mentioned Embiid or Parker as the top pick. So here’s another look at how it might go on draft night June 26. 1. Cleveland: Joel Embiid, Kansas center. Parker’s a small forward and you want to leave a space for LeBron. Having a potential star center and point guard suddenly makes them an inviting destination. 2. Milwaukee: Jabari Parker, Duke small forward. No one knows who’ll be the management with an ownership change just last week. But Parker’s a potential star, a smart player, great kid, a face of your franchise. Plus he’s just down the road from Chicago. The Bucks would be foolish to pass on him. 3. Philadelphia: Andrew Wiggins, Kansas small forward. They’ll sell him as the next Dr. J, which he is not. But he’s a high level athlete. It probably will take him a bit longer, but with their all young players they have time. Plus, they have the No. 10 pick and Nerlens Noel from last season coming. So they will have to start figuring out at some point to cash in someone for veterans. 4. Orlando: Dante Exum, Australia point guard. The new Penny Hardaway? A big, versatile point guard whom the Lakers supposedly were trying to hide away. Take that for stealing Shaq. They need a true point to keep Victor Oladipo at shooting guard and begin to form a team with all their young talent. 5. Utah: Julius Randle, Kentucky power forward. The pick should be in play as they basically have a young player at every position and extended Derrick Favors. They’ll try to trade for Parker, but anything is possible as they’d also supposedly put Gordon Hayward in a deal. 6. Boston: Doug McDermott, Creighton small forward. He’ll have to play smaller as he measured smaller than the 6-8 he always was listed at. Another next Bird? Like every white guy who can shoot. But shooting is vital in this NBA and what’s the difference if everyone else has him ninth? Pick who you like. 7. Lakers: Marcus Smart, Oklahoma State point guard. They’re going to be all in for Love, though it’s difficult to see with this pick and their roster what might attract Minnesota. But the Lakers are rebuilding and he’s a tough guard who can improve his shooting. 8. Sacramento: Aaron Gordon, Arizona power forward. Another team that will look to make a trade as they’ll remain among the most active. Is Gordon another Blake Griffin? He doesn’t have much offensively for now, but is tough and super athletic and smart and a leader type, which they need with DeMarcus Cousins. 9. Charlotte (Hornets): Nik Stauskas, Michigan shooting guard. Michael Jordan pulled off another coup as he gets a better pick than the one he lost to the Bulls for Tyrus Thomas from Detroit for taking Ben Gordon. They’re the Hornets now and badly need shooting. He could be ideal playing off Al Jefferson. 10. Philadelphia: Noah Vonleh, Indiana power forward. Could the Bulls persuade them to take their two picks to move up for a shooter? You assume the Bulls would try. But with their developing kiddie corps he’s a smart versatile big man who will fill a position. 11. Denver: Dario Saric, Croatia small forward. They have an odd mix of injured players and guards. Probably worth a try given the health uncertainty of Danilo Gallinari. 12. Orlando: Gary Harris, Michigan State shooting guard. A bit undersized for a shooting guard, but a good two way player who will fit in a nice guard rotation. 13. Minnesota: James Young, Kentucky shooting guard. Nice two way guard with good size and left handed making him somewhat less predictable. 14.Phoenix: Rodney Hood, Duke small forward. Should fit into their style with good shooting and offensive ability and not that much on defense. 15. Atlanta: Kyle Anderson, UCLA small forward. Versatile guy who can handle the ball as they could use someone other than Teague to make plays. 16. Bulls: C.J. Wilcox, Washington shooting guard. Shooting, shooting, shooting. He’s supposedly a pick in the 20’s, which gets you criticized on TV by basically no on who knows anything about the NBA. I never got caring where guys should be picked if you like them. When you redo drafts five years later you get plenty of lower picks worth more. There are no real centers in this draft, so the Bulls need to stick to shooting. 17. Boston: Tyler Ennis, Syracuse point guard. They’ll begin planning for their possible post-Rondo era. He’s a true point guard who plays both sides of the ball. 18. Phoenix: Adreian Payne, Michigan State power forward. Big man who can make shots and stretch the floor and also bang inside. Could be an interesting value selection. 19. Bulls: Zach LaVine, UCLA shooting guard/point guard. An interesting prospect who could slip here. Young and somewhat raw but with big time skills and an ability to make shots. An intriguing and exciting combo guard who some have had projected at the edge of the lottery. 20. Toronto: T.J. Warren, North Carolina State small forward. I assume someone by now will pick a big international guy I never heard of, but as I’ve never heard of any and only Saric has been mentioned as a high level prospect I’ll go with the versatile forward here. 21. Oklahoma City: Cleanthony Early, Wichita State small forward. Not going to keep Caron Butler for that long. They’ve got a bunch of young wing guys who haven’t made it, so maybe they keep trying. 22. Memphis: Elfrid Payton, Louisiana-Lafayette point guard. Sort of in the Rondo mode with more size. Not a great shooter but gets to the basket. 23. Utah: Glenn Robinson III, Michigan small forward. Pretty talented all around player with an ability to improve. Somewhat like Tim Hardaway Jr. in ability to surprise as a pro. 24. Charlotte: Jerami Grant, Syracuse small forward. Big time athlete with size but some shooting weaknesses. 25. Houston: Jordan Adams, UCLA shooting guard. Good shooter whom the Bulls at No. 19 could take a look at as well with their pursuit of shooters and players who can stretch the defense. 26. Miami: Nick Johnson, Arizona shooting guard. A little bit small, but a good shooter and athlete as they need to begin rebuilding their perimeter. 27. Phoenix: P.J. Hairston, D-League shooting guard. After being bounced from North Carolina for some indiscretions, he went to the D-League and is not considered a problem person. Talented good shooter. 28. Clippers: K.J. McDaniels, Clemson small forward. Not a great scorer, but the kind of athletic wing player they lack. 29. Oklahoma City: Mitch McGary, Michigan center. Active big man who can bang around so maybe they can finally get rid of Kendrick Perkins. 30. San Antonio: Clint Capella, Switzerland center. Thin big man who is a good athlete and future project.